The new phenomenon of Cyber Monday is today (December 2nd), and Protect Your Bubble’s special offer on mobile phone insurance, iPad and tablet insurance, laptop insurance and other gadgets continues to run through Cyber Monday until 6th of December. For this short period of time, all customers qualify for a 10 percent discount with a voucher code on its great value gadget insurance covers. Portable gadgets like smartphones and tablets are worth hundreds of pounds each, and are very easily lost, stolen and damaged. So getting comprehensive cover to give with your gadget gifts pays dividends. For those who love their new iPhone, Android smartphone, laptop, camera or other electronic devices, this may be the perfect gift for a stocking or to lie under the Christmas tree. Other products, such as the iPads, Samsung Galaxy Tabs and Windows Surface Tablets, will be eligible for the discount as well. ‘Cyber Monday’ is the new term for those who return to work after the Thanksgiving weekend in the U.S. The Friday after Thanksgiving, Black Friday, represents face-to-face shopping, while the ‘Cyber Monday’ means shopping online, often at work with high speed Internet capabilities. Protect Your Bubble is making this year’s ‘Cyber Monday’ special. 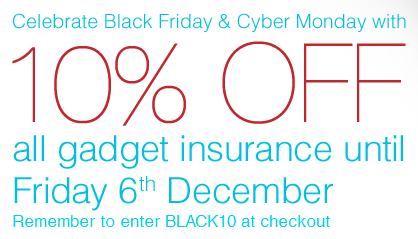 Until Friday 6 December, all gadget insurance policies will be reduced to protect against theft, damage and loss. Use the promo code BLACK10 at checkout for the 10 percent discount. The discount means the new iPhone or the latest Samsung Galaxy phone will have comprehensive cover from £5.39 per month. iPad owners will find protection from £4.31 per month. Stephen Ebbett, director of Protect Your Bubble, comments: “Black Friday and Cyber Monday are typically the biggest shopping days of the year, when Christmas shopping season starts in earnest, when shoppers realise they’ve only got 24 shopping days left until presents get unwrapped, and the realisation dawns that people need to leave extra time for online shopping deliveries. Online insurer Protect Your Bubble offers comprehensive cover at fantastic prices. Its expanding product range includes great value insurance for gadgets, pets, bicycles, travel, car hire and cosmetic damage to cars. Gadget insurance starts from as little as £1.49 per month.